“Maidan is an enigma to me, which I am yet to solve,” declares Sergei Loznitsa. What does it mean to film an event that surpasses all the ideas and presumptions that the one who films might have? How does one film and keep on filming the making and unmaking of a singular collectivity, itself composed of countless singularities who are caught up in a political process that resists simple identification and illustration? Loznitsa found himself confronted with these questions when he went to Kiev in the middle of December 2013, a few weeks after the wave of demonstrations had begun on Maidan square. He ended up staying for ninety days, as the events unfolded: from the peaceful rallies demanding closer European integration, to the bloody street battles between the protestors and riot police. But in contrast to the tendency of many “militant” filmmakers to position themselves in the heart of the struggle and capture its flow and flux by way of hand-held camera work, vivid testimonies and dynamic editing, Loznitsa presents the mounting unrest in a series of statically framed long takes, without interviews or commentaries. 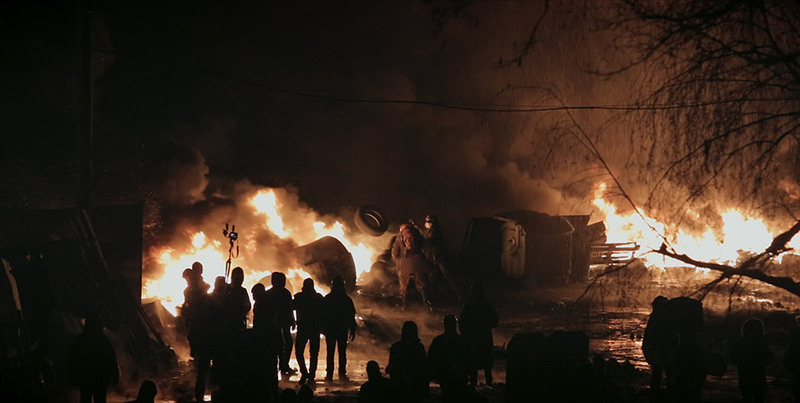 Rather than focusing on individual stories – as in, for example, Jehane Noujaim and Karim Amer’s depiction of the uprisings on Tahrir Square – he seems to be more interested in the collective aspect of the so-called “Euromaidan” protests, chronicling the sheer mechanics of human mass movement. What does this choice entail exactly? How are we to relate to these images of nameless bodies and sounds of bodiless voices? Which kind of relation between the small and the large, the singular and the collective does it propose to us? And how does filming the “body of the people” relate to the dominant notions of populism that we have inherited from some of those who deplored the rise of the revolutionary movements that put an end to the reign of kings and nobles?